Home Blog Cutting down on plastic, one nappy at a time. Cutting down on plastic, one nappy at a time. Why Indira Kemp is choosing cloth nappies instead of disposables. 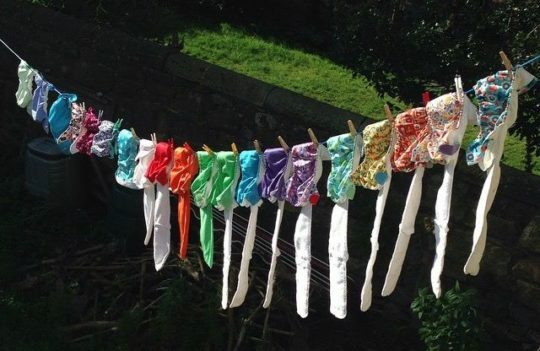 When I found out Friends of the Earth Scotland were looking for someone to write a #PlasticFreeFriday blog on reusable nappies – also known as real, cloth or washable – I quickly volunteered. You see, I’m a crazy nappy lady. I freaking love cloth nappies. I first became aware that cloth nappies exist in the modern form they do now years before I became pregnant. While old-school terry squares are still used (and are the cheapest option), modern cloth nappies are very similar to disposable ones in terms of their shape and the way you use them. There are so many reasons that people choose to use cloth nappies – better for baby, they turn out cheaper in the long run, more reliable (no more poosplosions, thanks all the same! ), more ethical; but people usually stick to cloth nappies because actually, they’re just super freakin’ fun and awesome and you become a bit of a nappy addict. But we’re here on Friends of the Earth Scotland’s blog, so I’m going to focus on the biggie – the environmental reasons people choose to go for a cloth bum. In Scotland alone 450,000 nappies go to landfill each day. Yes, read that again, 450,000 every day. That’s 160 million nappies a year. In Scotland alone. It’s estimated that disposable nappies take up to 500 years to decompose. Your child’s poo will still be sitting in some nappy in a refuse site somewhere when, not only you, but also your children and grandchildren are no longer here. Our children’s poo have a longer lasting legacy than we do. Now, I know that I personally do think the sun shines out my baby’s behind, (at least some of the time) but that notion doesn’t sit well with me. Also, following our most beloved Sir David Attenborough’s recent Blue Planet II, and the sudden shift in public awareness of plastic (which I’ve dubbed “The Big Bad of 2018”), we really have to face the hard facts that plastic is a pretty major component of disposable nappies. It’s difficult to know how major, and what else, exactly, is inside disposable nappies, as the big companies are very reassuring about the safety of their product but also quite vague about what’s in them. However, the main ingredients are plastic (polyethylene, polypropylene) and (bleached) wood pulp, with various chemicals (sodium polyacrylate, dyes, perfumes, dioxins). While disposable nappies can take half a millenium to decompose, they’re obviously breaking down all the time, and these plastics and chemicals seep into our earth and oceans, along with the untreated poo. Reusable nappies do have plastic in them, but a key point here is reducing single-use plastic, and disposable nappies are a single-use plastic product. The technology exists to recycle disposable nappies, however it’s not a service that is widely available at present. The recycling industry is currently working to improve this. There are biodegradable disposable nappies on the market, with criticisms that they don’t biodegrade fast enough for people to realistically put into their own compost bins at the volumes we use, and if they go to landfill, landfill is designed to slow the biodegradation process down, so it almost defeats the purpose. In terms of the manufacturing process, the sheer scale of the amount of disposables required uses more raw materials, and these chemicals, particularly bleach, have a negative impact on the environment. Also there’s the consideration of transportation of the products. In comparison, the carbon footprint of using washable nappies is significantly lowered if they are washed at lower temperatures (below 60) and in larger loads, dried on the line (not tumble dried), and if they are used for subsequent children or passed onto others. It can be pretty overwhelming stepping into the wonderful world of cloth nappies, but a key point to remember is that it doesn’t have to be either/or. Even using one cloth nappy a day reduces the number of nappies you contribute to landfill by over 900, based on one child being in nappies for two and a half years. There are cloth nappy libraries and communities all over Scotland, providing support, advice, nappy sales and kits to parents and parents-to-be. I cannot emphasise enough how much I’d encourage anyone interested to try. I don’t want to be the only crazy nappy person around. They offer excellent services, cloth nappies are fun and the environmental benefits are huge. This is a guest blog to highlight the ways you can get involved in #PlasticFreeFriday. Indira Kemp is a member of the Edinburgh Real Nappy Community. Find out more about them on Facebook. How do nurseries deal with the amount of hygiene plastic they have to dispose of? If staff are required to use a new apron and gloves and dispose of the nappy EVERY TIME, can the aprons and gloves at least be made out of paper or biodegradable plastic? There has to be change on this now too. The sheer amount of disposables from nurseries and creches must be astronomical.